Today's challenge over at the Everybody Art Challenge Blog is Valentine. I have made my card as masculine as possible without using the traditional red,black or pink. I have also kept the sentiment generic so that the card can be used for a birthday if required. 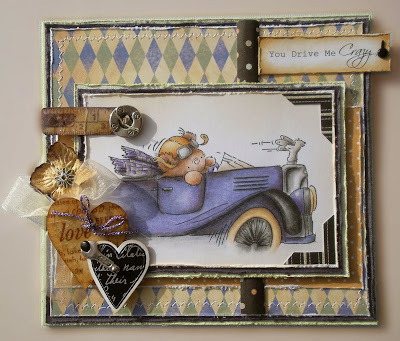 I am entering my card in the Fussy & Fancy Friday Challenge which is Valentine without red or pink. The cute image is from LOTV sent to me by my fellow DT member, Domi. Thanks Domi. I have used Prisma Pencils to colour the image and for some reason be it camera or light, the car doesn't look as purple as the colour I have used. The base card is Core-ordination's card, layered with purple bazzill card, then Kanban paper and finally the dotty paper is from a new pad called Animal Antics by First Edition Paper. I love looking at this paper! The button is the closest I could get to a wheel and its from the Tim Holtz range as is measuring tape stamp. The bigger heart is homemade using UTEE and an Anita's sentiment stamp, the smaller hear is a sticker layered onto card. The hearts are held together with a spanner brad and round brad. The sentiment I created on the computer and tried to make it look like a sign post. I think I failed miserably. I only added one flower to fill a space. I find it very difficult to find masculine embellishments that are not golf or football. I hope you like the card and can find time to join the challenge this week. Oh, WOW! This is BRILLIANT Jenny - love it! Wonderful job. Your coloring is ... wow !!! I Love your card! Its adorable. Thanks for joining Fussy and Fancy friday blog challenge this week! Oh Jenny this is fabulous, wonderful image and details. Oh my this is fantastic Jenny! Jenny, this is perfect! Love all the beautiful details and the color combo!